A little known fact about Christmas... Just as Santa is travelling around on his sleigh dishing out presents.. Paul Koller's elves were stalking the Earth installing extra ram and cpu clock speed into everyone's C64s while you're asleep. There can't be any other reason Paul Kollers' infamous ports function on a 36 year old 8 bit microcomputer! If you need proof just check out Super Bread Box, Micro Hexagon, C64nabalt and the recent phenomenal LuftrauserZ (RGCD). Judging by these tweets last week, the engine to his next game (a port of 2008's) Spelunky looks like it won't be any exception. Whip animation and collision detection correctly implemented. Expect some in-game footage soon! 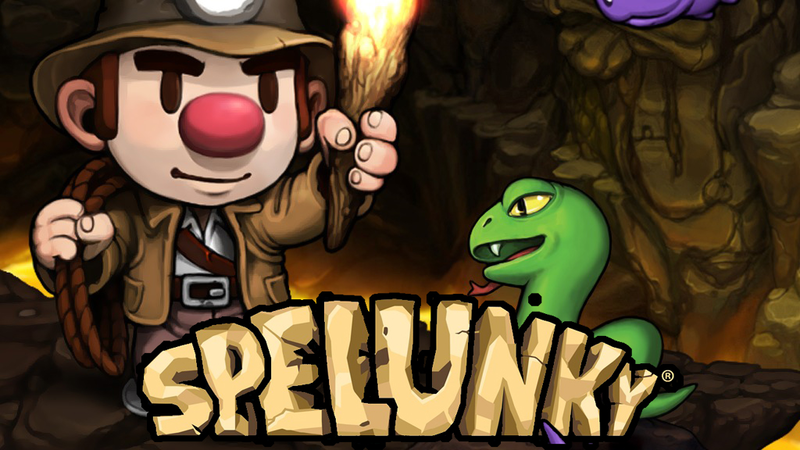 Spelunky is an action/puzzle platform game, where you play as the Spelunker who must explore tombs and other locations looking for treasure, (and love!) avoiding traps, blowing up scenery and enemies while escaping with as much loot as possible. Levels are procedurally generated, so no two adventures will be the same, and the game's original Windows source code has been open source since 2009. Ensuring ports and clones will be released on many more platforms than just Windows PCs. The C64 version seems to be progressing well, as the 1 minute video clip shows. It looks like many of the graphics and collision detections have been implemented. Including snakes, ladders, wall climbing, a cute animation when nearly falling off a block, the whip attack and enemy death animations. Anyone wanting to checkout the original Spelunky can get the game on Steam for Windows PC (other platforms available). But I can't wait for the C64 version. Two brand new C64 games got released by Psytronik Software today: Steel Ranger and Pains n Aches - A Knight & Grail Adventure. Various physical copies available to preorder on the Binary Zone retro store page (currently with a $10 discount). You can also download and play the games today on real hardware or emulation by either pre-ordering a physical copy or by buying the download versions from Psytronik's itch.io page.